Built in 1958, the Tamarisk Ranchos are an enclave of 16 Palmer & Krisel-designed homes in Rancho Mirage, CA, just west of Palm Springs. 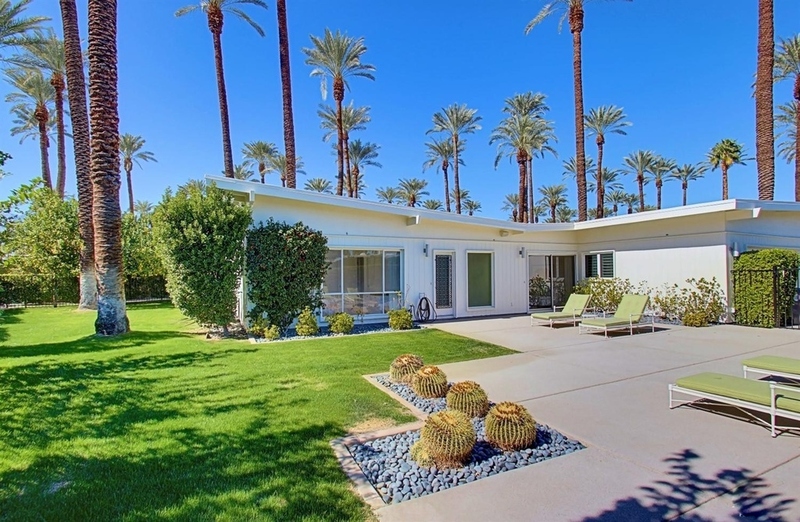 The homes sit amid date palms and are set back on private, lush grassy lots surrounding a common swimming pool. 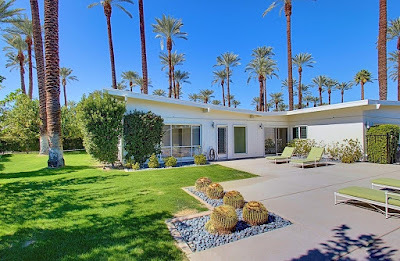 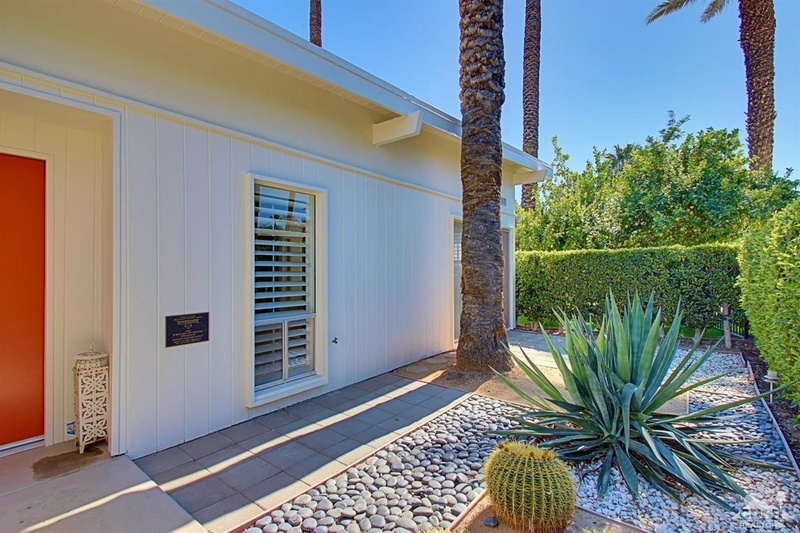 All 16 homes are listed on the Rancho Mirage Register of Historic Places, including todays featured property. 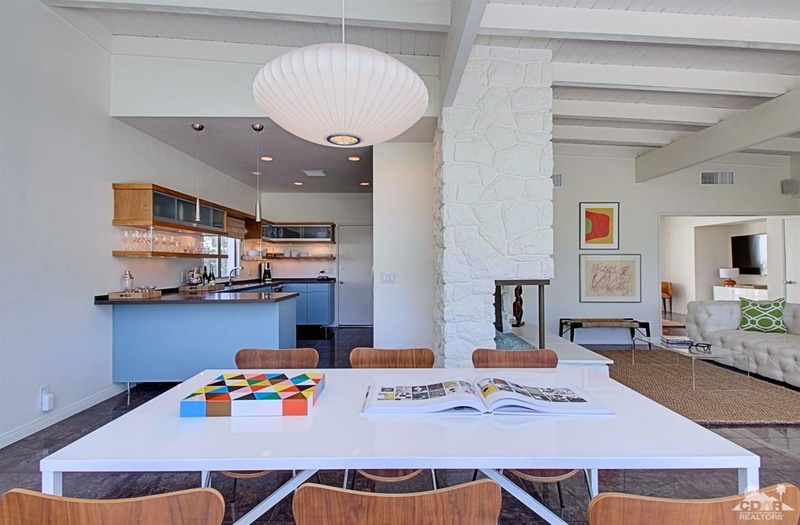 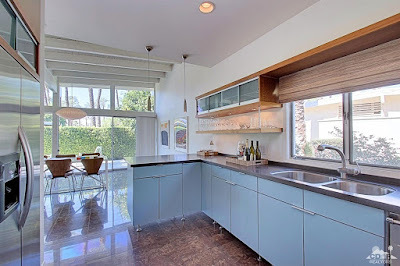 With three bedrooms and three bathrooms in 1,956 square feet, a single car garage all on an unfenced 10,400 square-foot lot, the asking price on this unique midcentury home is $629,000. 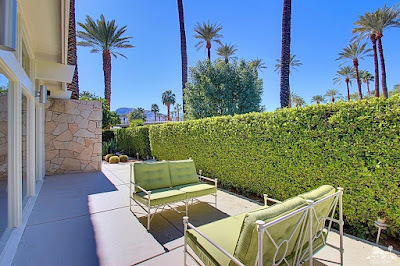 Situated on a corner lot, the home sits hidden from the street by rows of well-manicured privacy shrubs, like most other Tamarisk Ranchos properties allowing for the front yard to become a private oasis. 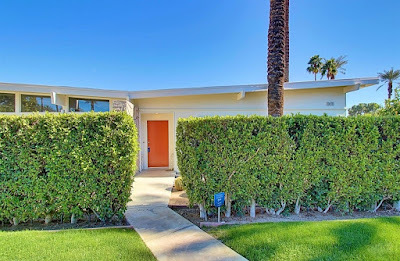 The house actually sits inverted on the lot, with the front door facing the rear Tamarisk Ranchos common area and a large private patio in the traditional front yard of the home. 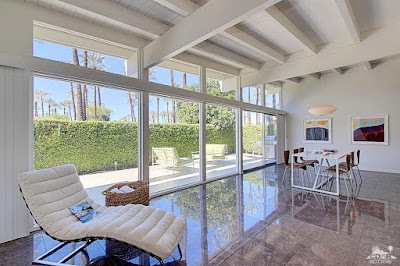 The living and dining areas sit at the rear of the home and overlook a linear private patio adjacent to the Tamarisk common area through large walls of floor-to-ceiling glass windows. 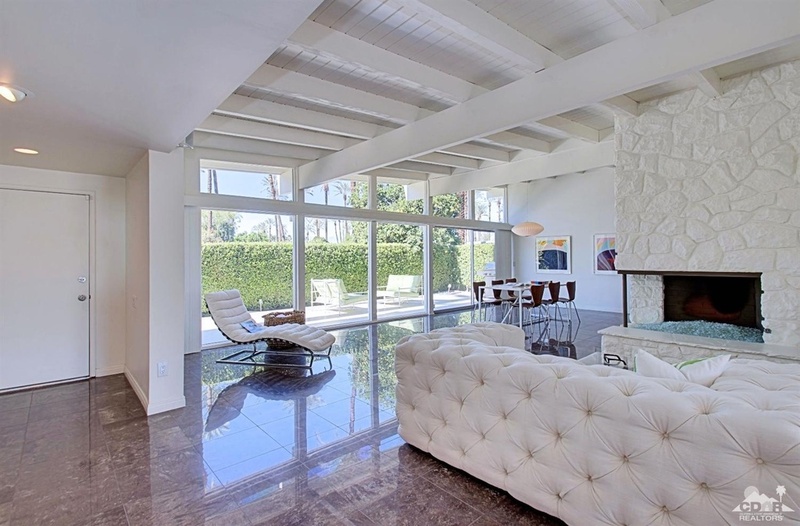 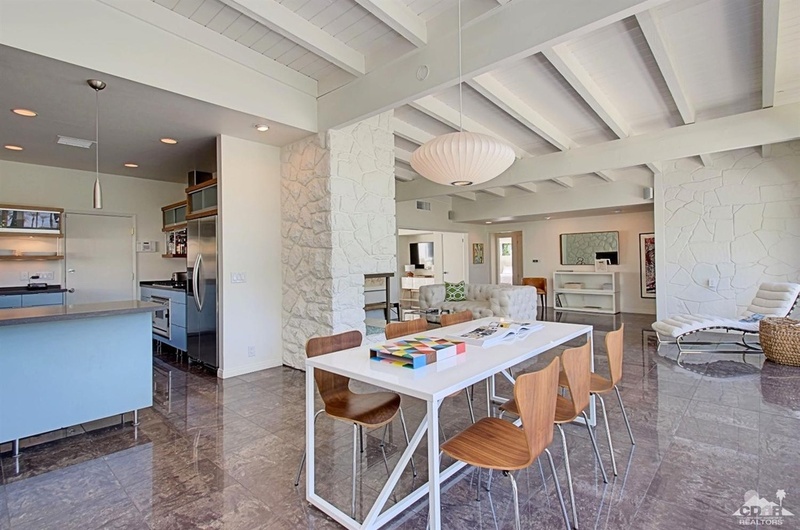 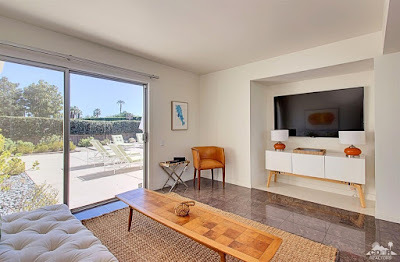 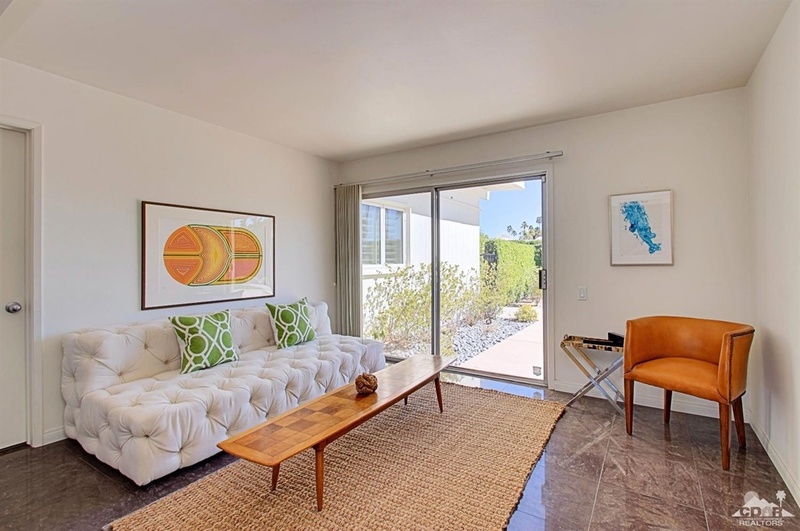 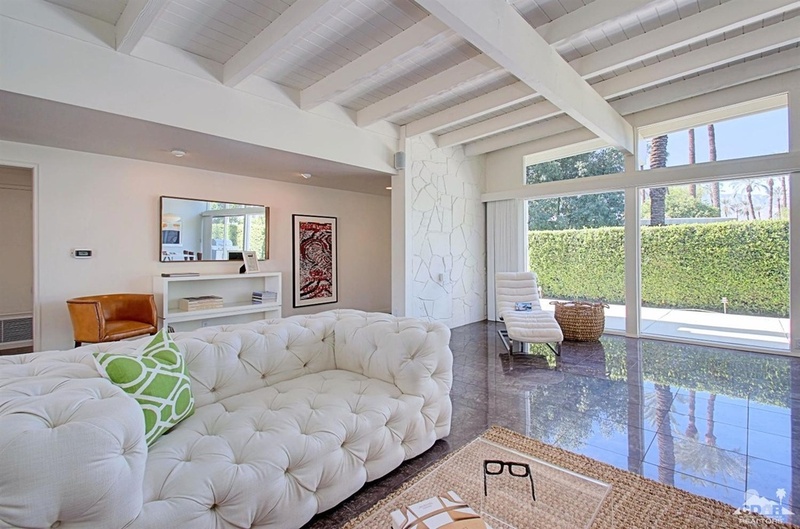 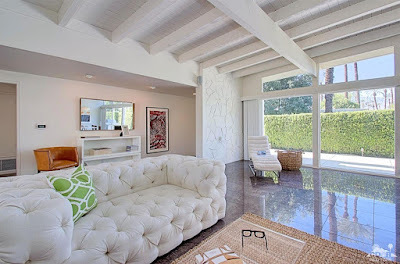 High gloss flooring with a patter reminiscent of midcentury VCT tile sets the tone of the rooms, while signature open-beamed ceilings add height and volume. 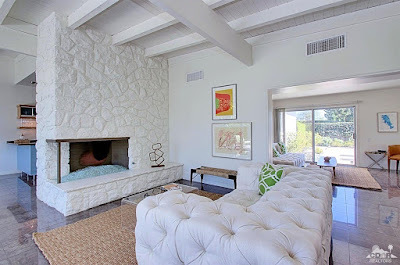 Both the living and dining rooms are large and well-proportioned, and a large corner fireplace anchors the living area and serves as a centerpiece to the rooms. 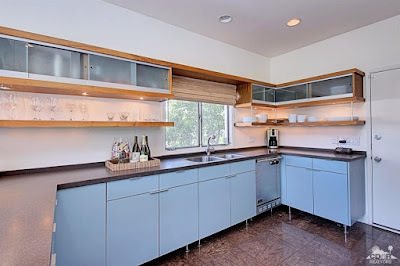 The kitchen sits just off the dining room, and has been updated with clean, low-profile cabinetry. 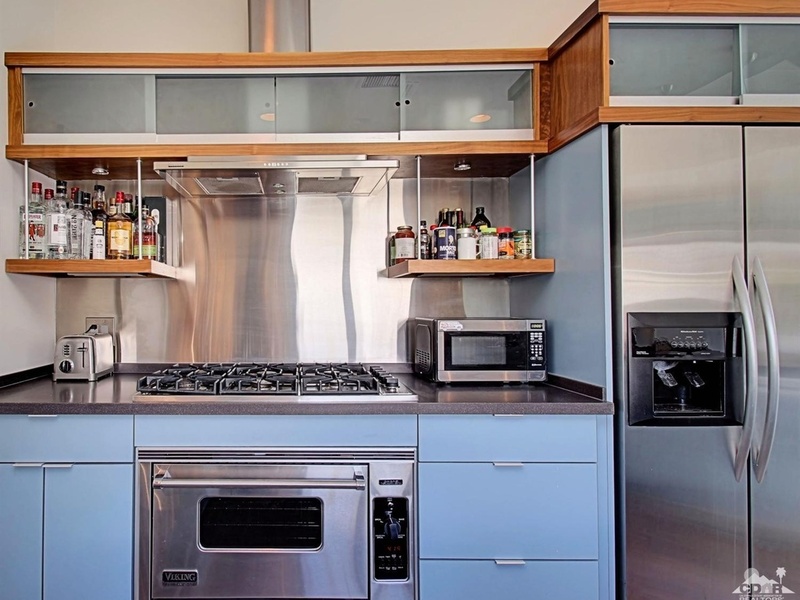 Soft blue gloss cabinets make up the lowers, while contemporary and clean frosted glass and natural wood open shelves and sliding cabinets make up the uppers. Stainless steel appliances and composite counters round out the room. 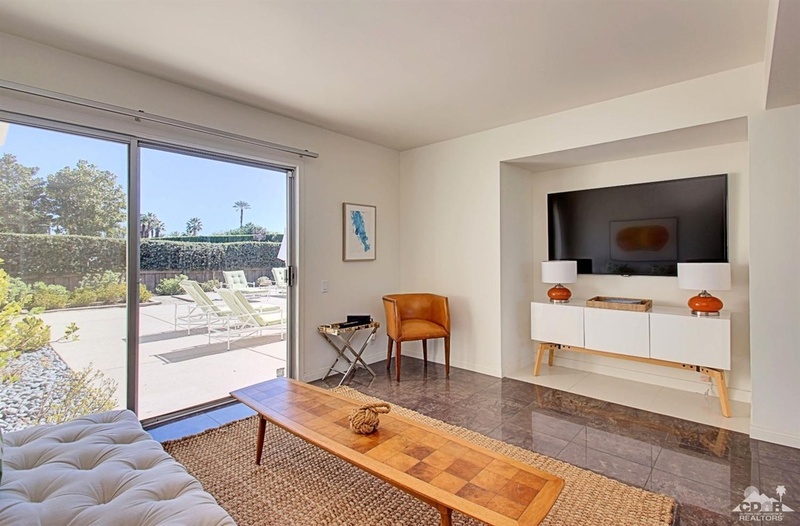 A small open den sits off of the living room, and provides access through a large sliding glass door to the front yard patio. 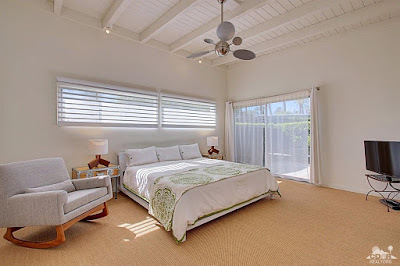 The master bedroom sits at the front corner of the home, and opens to the front yard patio space. Windows on opposing walls allow the room to be light-filled and airy. 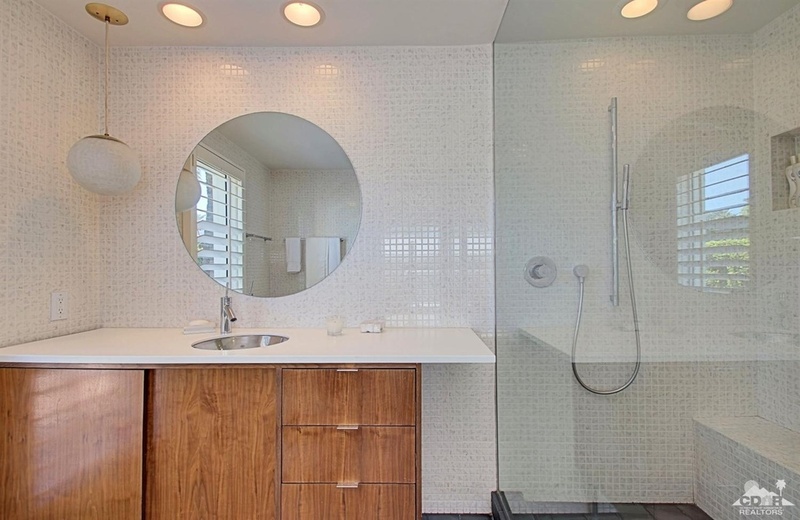 The master bath has received an exceptional renovation with a nod to the modernist roots of the home. 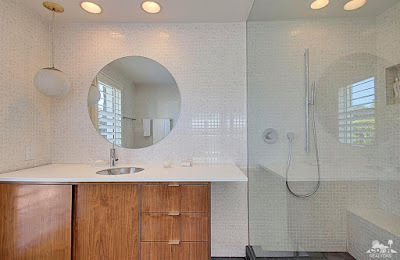 Clean, light, fitting mosaic tiles line the walls of the room, while low-profile cabinetry and a fitting pendant sconce highlight the space. 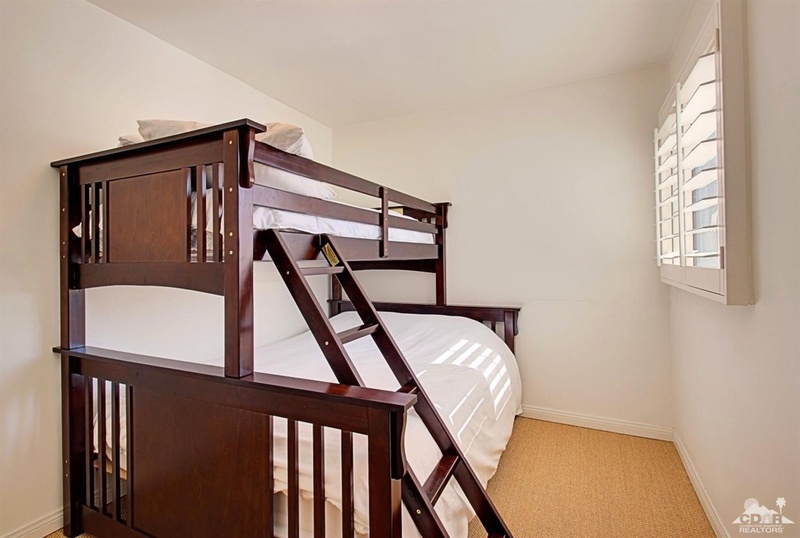 The larger secondary bedroom also features windows on opposing walls overlooking the front yard patio space, while the smaller secondary bedroom is diminutive in size, and batter suited for a home office or nursery. 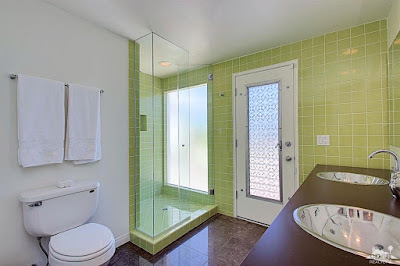 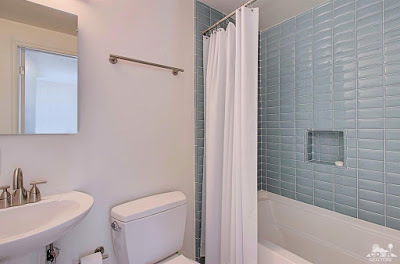 The secondary guest baths have been carefully renovated with attention to detail, one featuring appropriate three-inch soft green tiles while the other features rectangular periwinkle blue tilework. Private patio spaces surround the front and rear of the home, enclosed with thick, healthy shrubbery. The common area at the rear of the home is a large, palm-lined green space which features a heated community pool at the center of the neighborhood. 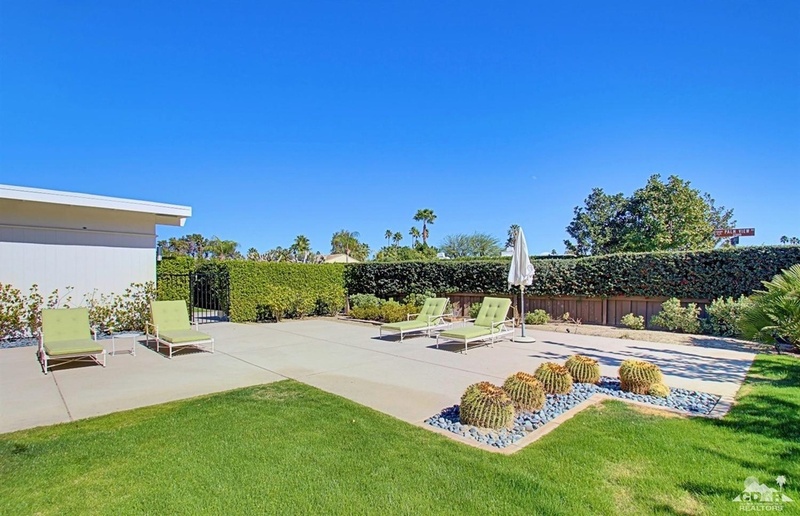 This home is a great example of a well-maintained and well-thought-out Palmer & Krisel-designed property. 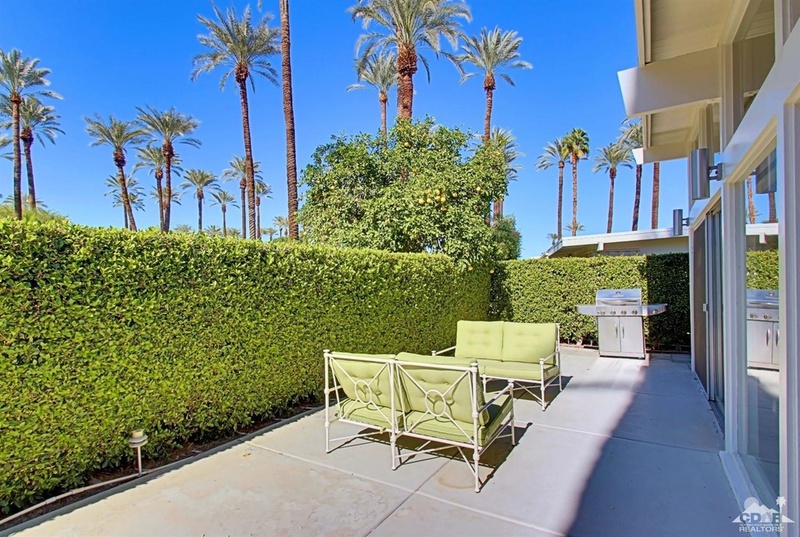 The property is move-in ready, and offers a unique opportunity for those looking to live in a quiet, park-like estate.